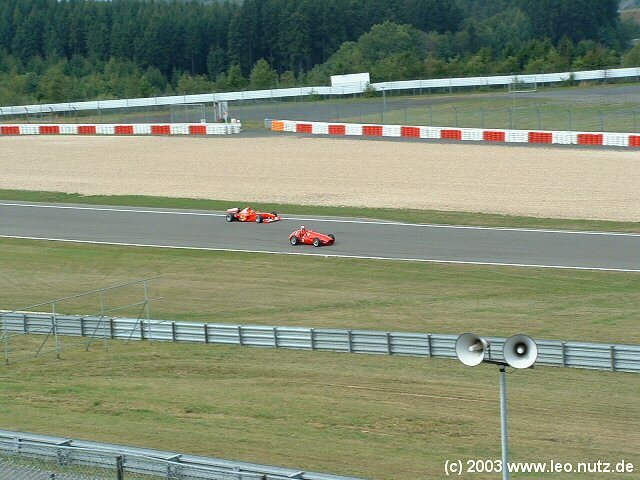 On Saturday our only agenda was to watch the 6 hours endurance race over the Grand Prix and old Nordschleife track. Unfortunately we arrived a tad to late and just missed the warmup lap. After getting over our disappointment we headed to the grandstand to find some seats and get ourselves something to eat and watch the first part of the race. Finding a good view on the track was easy as there were a lot of free seats. 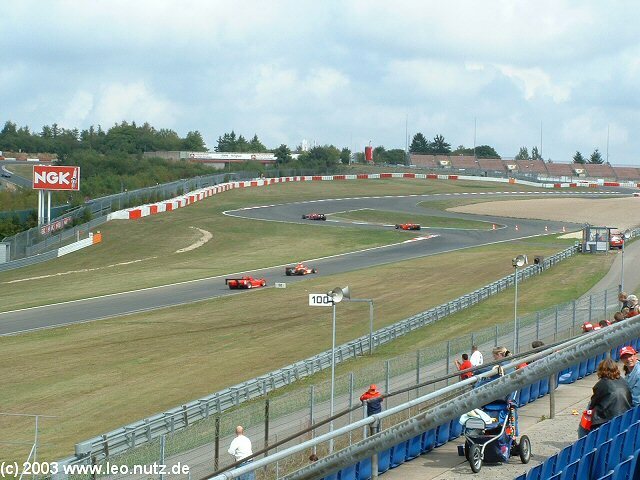 We could hear the engines revving up as the pack of cars were ready to accelerate to begin with race when all of a sudden the track speaker reported a major crash on the straights. A BMW got clipped by behind and rolled over 3 times until the car hit the rails. 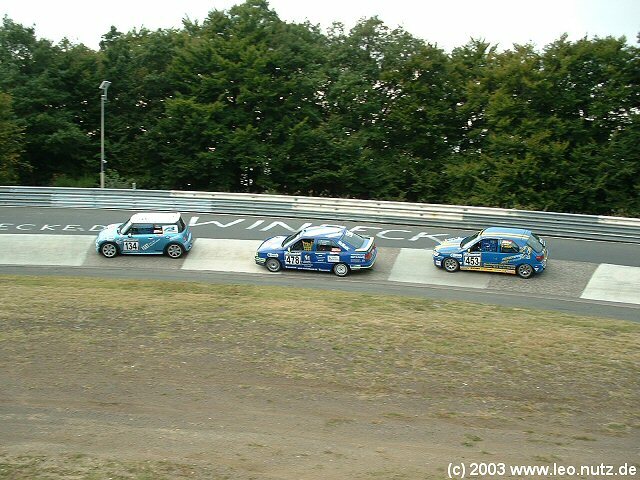 The race was stopped immediately. 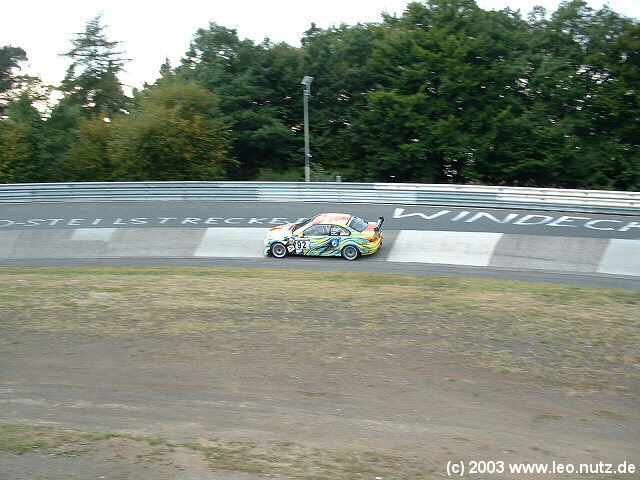 We later found out that the driver ''only'' had a brocken arm. It could have been a lot worse. The car was a total loss. 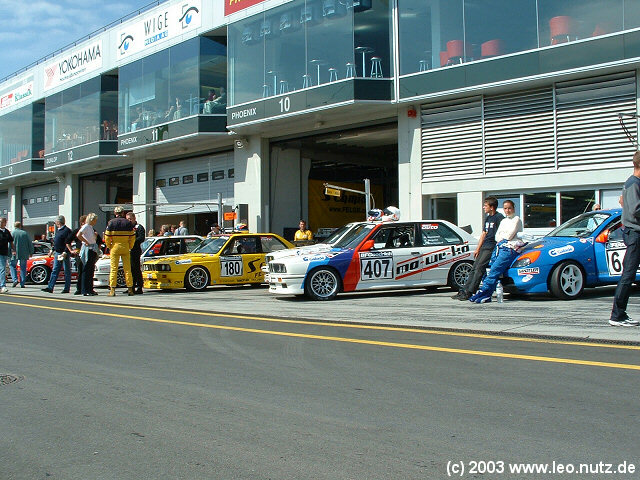 Here is an E30 M3 that when all was done came in 3rd! 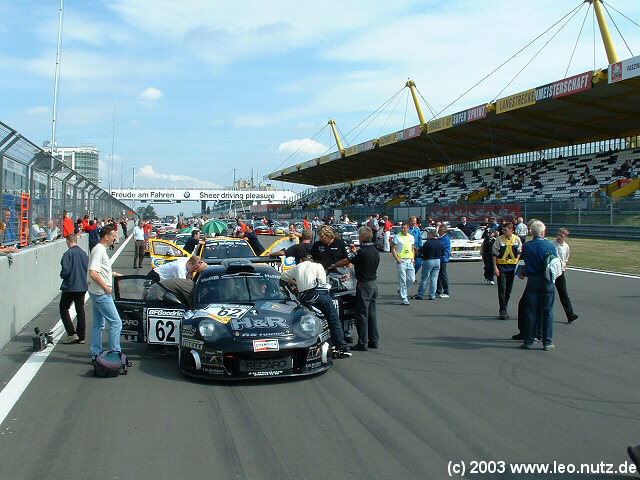 One very fast oldtimer! 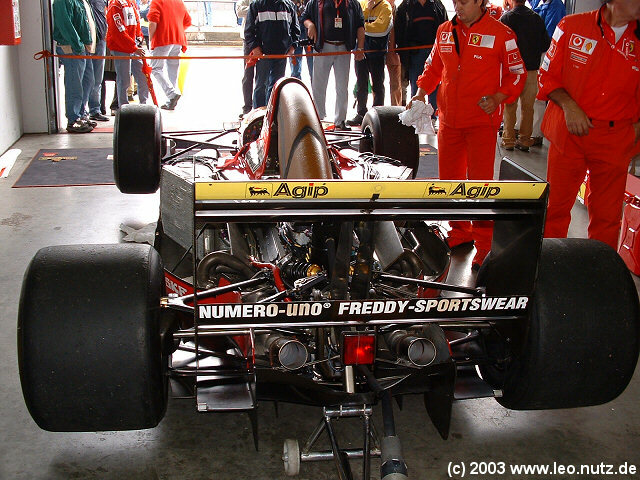 Here (11.5 MB, WMV Format) is a video segment taken in the pits and the starting grid. 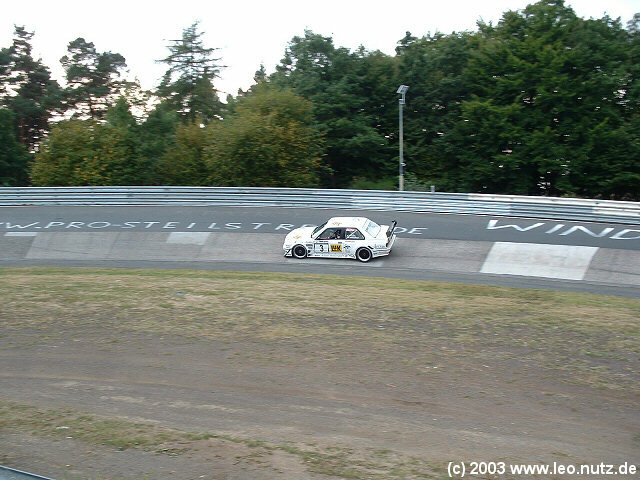 Below is the famous 'Caracciola-Karussell'. It is really cool to watch the race cars coming into and out of the carousel! 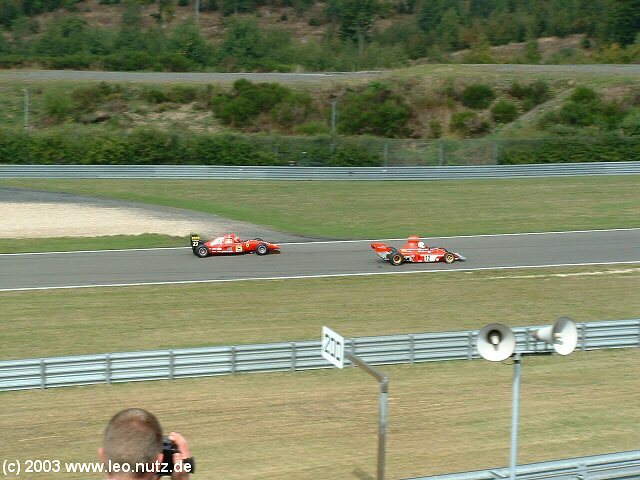 Here (6.1 MB, WMV Format) is a video with the starting grid taking off / first lap and here (8.5 MB, WMV Format) a video taken at the 'Caracciola-Karussell'. 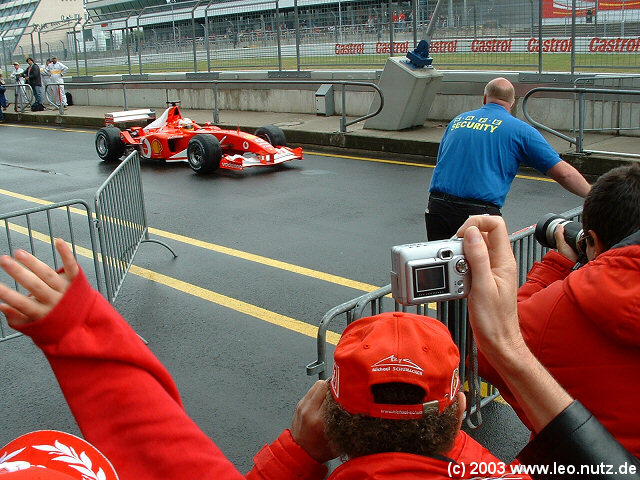 In the next video segment Michael Schumacher gets out of a Ferrari Modena and waves to the crowd. 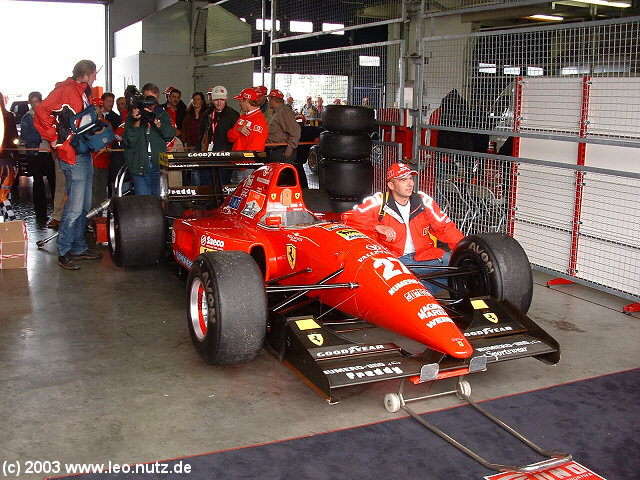 Afterwards Ferrari F1 race cars from different time periods are on the track. Click here (15.2 MB, WMV Format) to view the video. 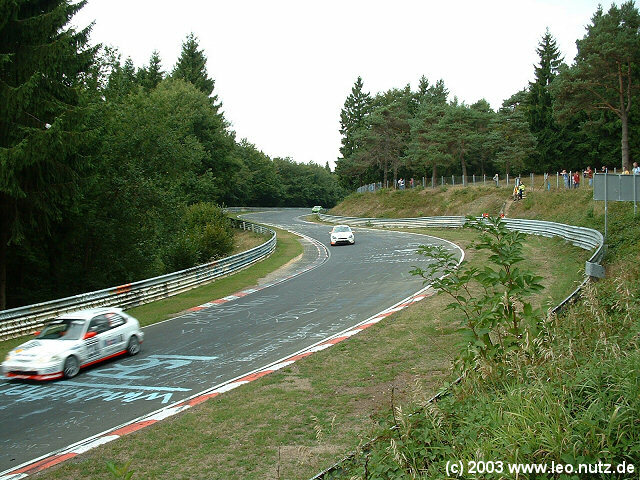 In the afternoon it was our intention to do some driving on the Nordschleife. Once we got there we were amazed as to how crowded it was. As I watched all the cars and bikes flocking the track it was clear to me that I was not going risk going on the track. Later in the afternoon our friends from the restaurant showed up. Among them was a guy by the nickname of 'Isch'. I've met this guy several times and he has got to be one of the best amateur drivers out there. 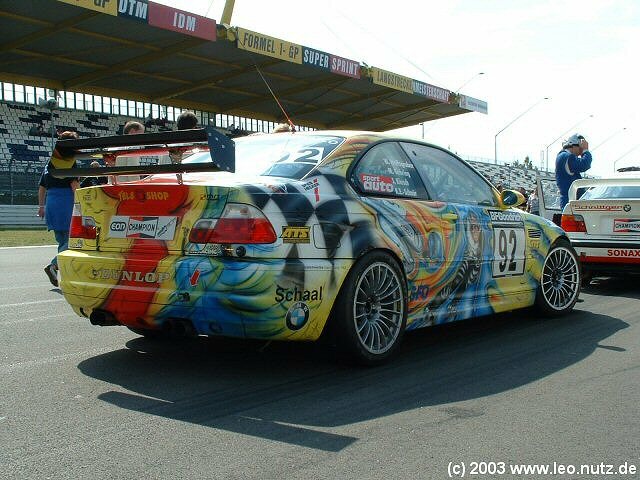 I had always wanted to take a ride in his modified M3 and as it just so happened he ask me if I wanted to hop along. Of course I couldn't refuse. Finally we come up for the second turn that I was looking forward to. Well.... what can I say. It was better but nothing that I had expected. 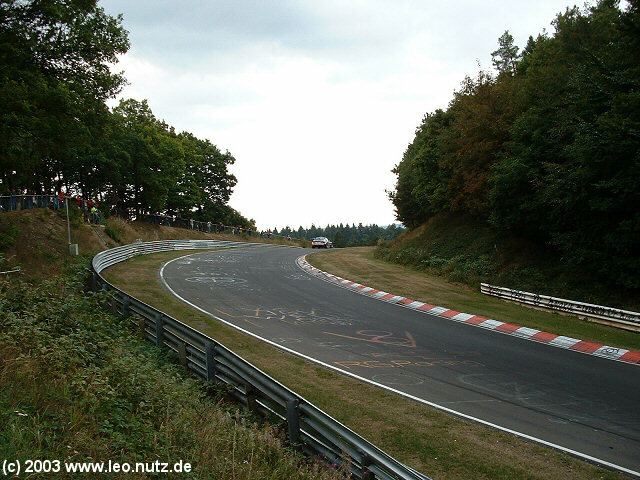 I was looking for the famous 'Isch Nordschleife Turn' but it really didn't happen I don't know why he was so conservative but when the turn was done and we entered the pits he kinda got the message that couldn't have been it. He noticed my disappointment and asked me if I wanted another turn which of course I agreed to. I then felt a lot better and couldn't wait to get the show on the road . Now, you might ask if I got my adrenalin going? Well... the answer is no. This was because Isch's driving style was so confident that I never once had the feeling he wasn't in control. His car is fantastically set up. The cup tyre's glued to the track like nothing I've experienced before. 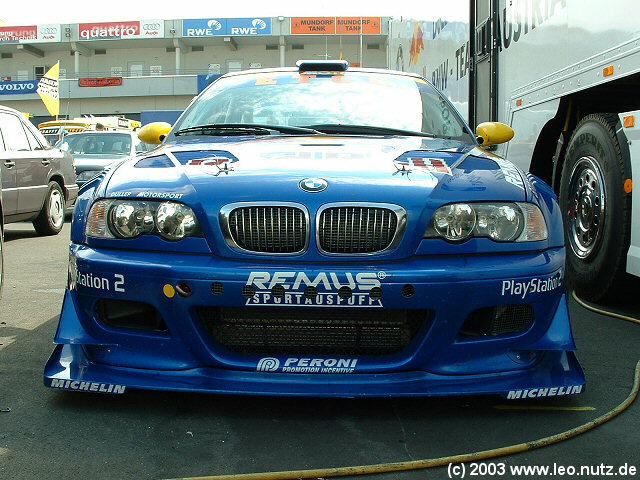 Never once did his M3 slide in a corner or show any chirps or squeals from the tyre's. The driver wasn't cramped to the steering whatsoever, his hands as dry as a babies bum after it got powdered by mommy. Watching him take the corners was a blast. The ride was pure pleasure! 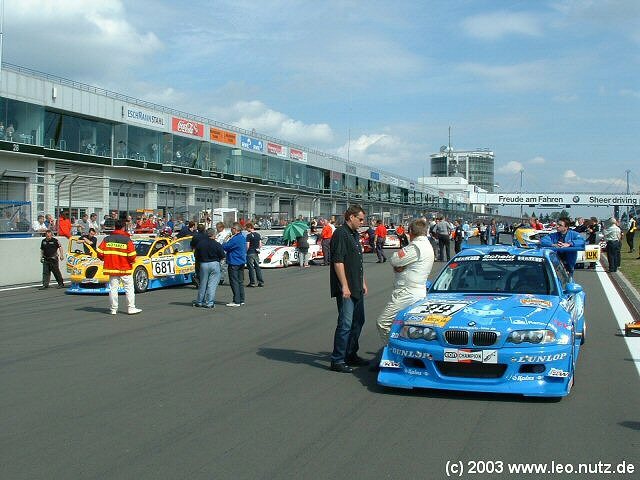 Here a picture I found on the net of him and me (codriver) on the track that day! By the way, no mods were done to the engine and exhaust system. 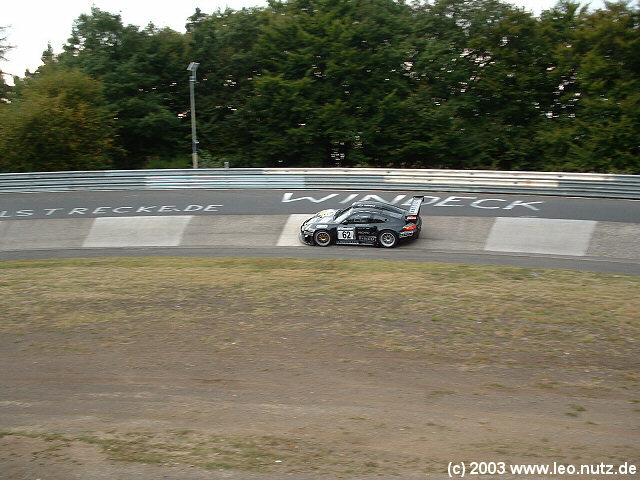 Well, the traffic lightened up a bit on the track and I had wanted to do some turns of my own. Unfortunately I was out off luck as the track was closed for the day due to a big accident. So we decided to have a bite to eat and then head home. While cruising on the Autobahn something up front caught my eyes. 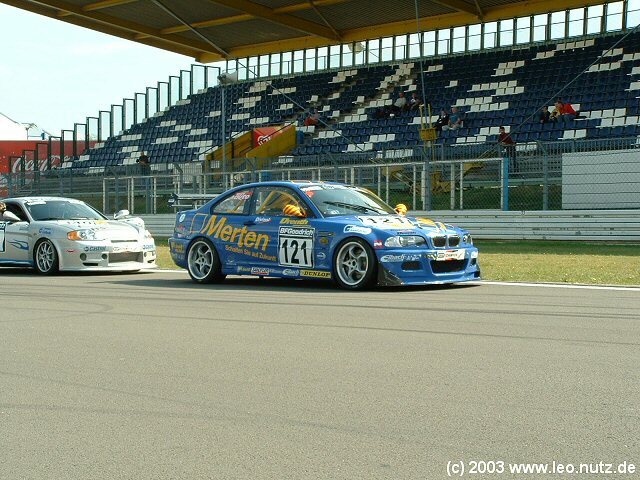 Yes oh yes, it was a CSL. When things like this happen there is only one thing to do. Full speed ahead and pull up one foot behind the prey Well, the CSL driver got the message and woohoo it was a go! I don't want to go into detail as to what happened next but just say we drove like wild maniacs and believe it or not..... the CSL fell prey. I was more than surprised to say the least. At one point I drove up to him on the right side. His (one damn good looking) lady friend and him gave me the thumbs up. I then realized who it was, the guy at the restaurant I met and he knew who I was. Well, we continued the race for about 30 minutes and I could get away from him every time. Frankly it was too easy! Then he lost me.... such a shame but I didn't want to wait for him. He later told me he needed to fill up his baby. The next day I got an email from him where he congratulated me on the encounter we had the fortnight. He was baffled as how I could out accelerate him every time. 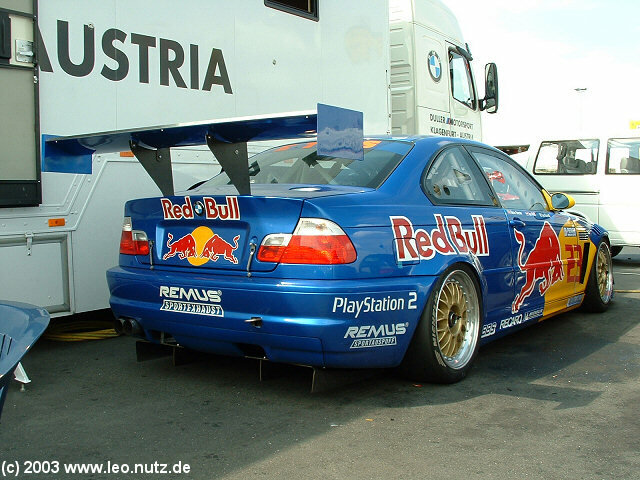 He then told me it had to do with the cup tyre's he had on for the Nordschleife. Once warm they get so sticky that he loses power to the raod and therefore couldn't accelerate as fast as my M3. I (sorta) agreed and we left it at that. Well, several weeks later I get another message and he tells me that there was something wrong with the air intake system and that BMW corrected it. Seems he didn't have the power which would frankly make more sense than the warm cup tyre's because the performance difference was to big. 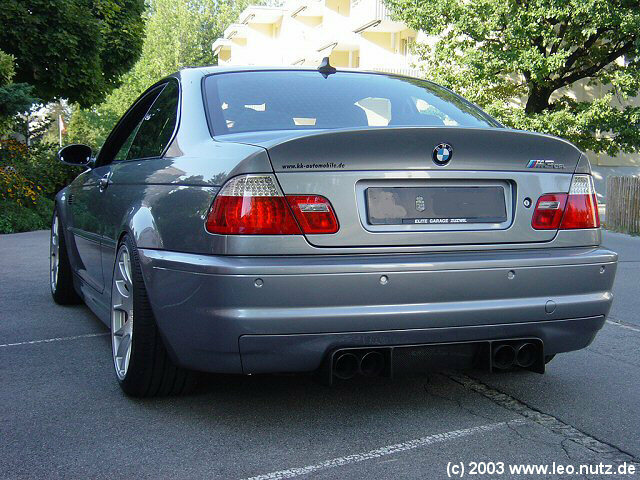 Now the problem here is that he has a heavily modified CSL which proved fatal in our little encounter. 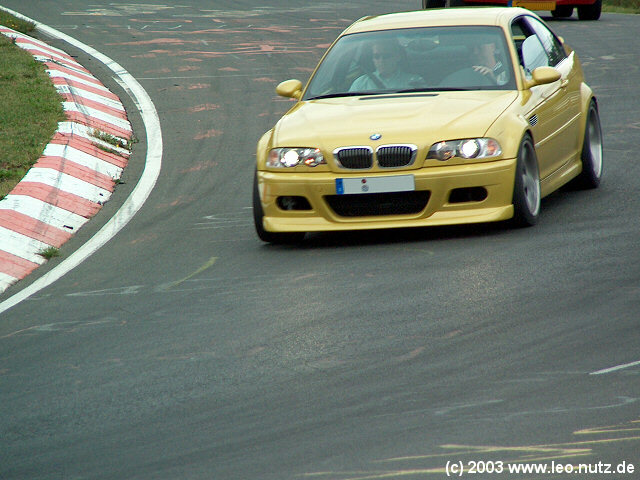 Again let this be a warning that anyone moding the M3 engine e.g. altering intake, software or exhaust system MUST know what they are doing or else are going to gain the opposite! 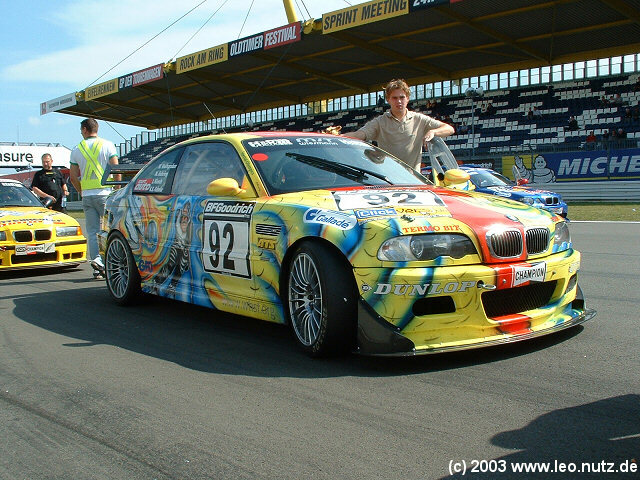 I can only emphasize people not to fool around with already perfect M3 engine. 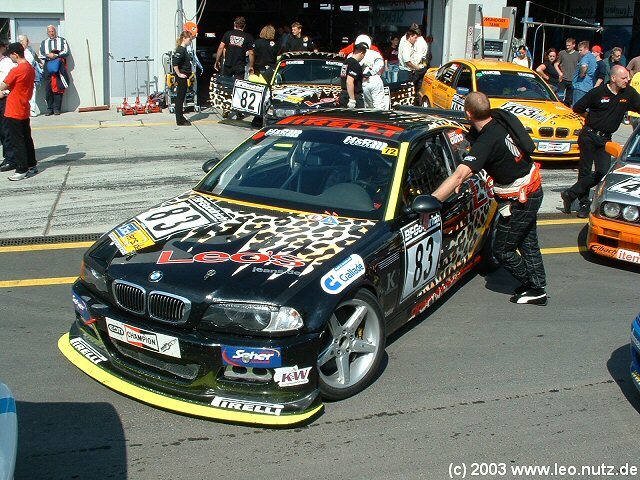 This isn't the first time a modified M3 had problems with my stock M3. Currently 12 users are browsing this web site, 628060 having visited since June 8th, 1997.